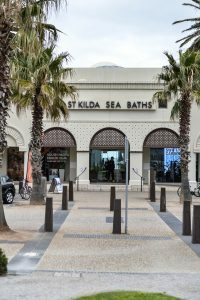 Established in the 1930s, the St Kilda Sea Baths are a one-stop-shop for St Kilda’s fitness fanatics. The well-maintained lap pool is filled with water derived directly from the sea and is heated to a comfortable temperature, providing surprising benefits to the muscles and the skin. Join in on a water aerobics class or swim the lengths of the spacious pool – both fantastic options for exercise which is light on the joints. Also housed within the Sea Baths building is the South Pacific Health Club which has all the facilities of a state-of-the-art gym, for those who prefer to keep dry. Following your work-out, choose to sweat it out in the sauna or treat yourself to some R&R at Spa Dreamtime. When the weather heats up, so too does the competitive spirit at the beach! Each Tuesday, Wednesday and Thursday evening in the warmer months, the volleyball nets go up outside Republica on the foreshore and two teams will face off on the sand. Republica also offer pizza and a free drink to every volleyball player, so be sure to register when competition starts up again in October! For those looking to hit the water for a workout of a completely different kind, look no further than the foreshore. Be sure to chat to the experienced instructors at The Zu Boardsports or Kite Republic to get you started on your first stand-up paddle-board. Floating on top of the bay might look like a piece of cake from afar, but this popular water sport requires some serious strength and balancing skills! With such a scenic backdrop, it’s no surprise that St Kilda provides some of the most beautiful walking trails in the region. These trails are perfect for a leisurely walk with the dog, running training or even cycling. 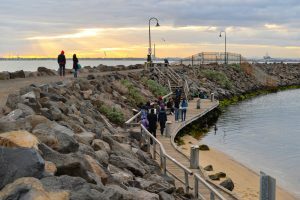 The Foreshore Trail stretches over 11 kilometres from Port Melbourne to Elwood, and the St Kilda leg of is a picturesque mix of city, garden and sea. The short stretch takes walkers through the beautiful Catani Gardens, past the foreshore and the St Kilda pier and into buzzing Acland Street in time for lunch. The Solar System Trail is one of the most unique walks in Melbourne. In 2008, a group of artists and scientists constructed the trail from St Kilda to Port Melbourne, replicating the solar system on a scale of one to one billion and marking each planet with a replica sculpture. The trail naturally starts with the sun which is found at the lighthouse in Marina Reserve and stretches all the way to Pluto in Port Melbourne. For more details on the Foreshore Trail and the Solar System Trail, plus more self-guided walks, visit the Port Phillip website. 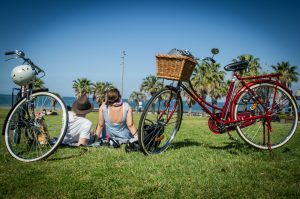 If tackling the tracks by bike tickles your fancy, find out about Melbourne Bike Share or visit SwiftCarbon at the St Kilda Sea Baths for expert advice on purchasing your very own bike. St Kilda’s fitness loving population has brought a plethora of gyms and fitness clubs to its streets. Zumba group fitness is an unstoppable craze and Zumba United on Argyle Street is guaranteed to get you grooving. Challenge yourself with a high-intensity workout at the popular CrossFit St Kilda on St Kilda Road or get out the boxing gloves at St Kilda PCYC Gym on Inkerman Street. s Yoga are perfect places to start, or take a class in traditional Iyengar yoga at St Kilda Yoga School, focussing on postural alignment and body awareness. Keeping fit has never been so fun. 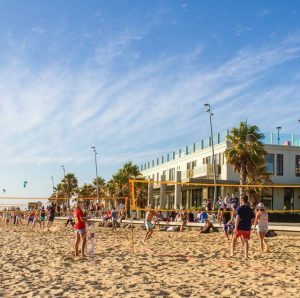 Whether you’re partial to trying your hand at some water sports or breaking a sweat on dry land, there is a multitude of ways to move your body in St Kilda.